This is one very nice vacuum pot. Stylish, easy to use and easy to clean. Has everything you need to make wonderful vacuum style coffee. It even comes with a stove designed so the glass never touches the burner. Silver banding is perfect. The pot is Silex all "Pyrex" glass, gasket, cloth filter, splash prevent lid and pour lid. Everything is in perfect condition with exception of having to use a Cory style pour lid on the pot. . This makes absolutely excellent coffee. The stove is made by Silex and is 525 watts. Comes with original cloth cord which is in great condition and 6 feet long. 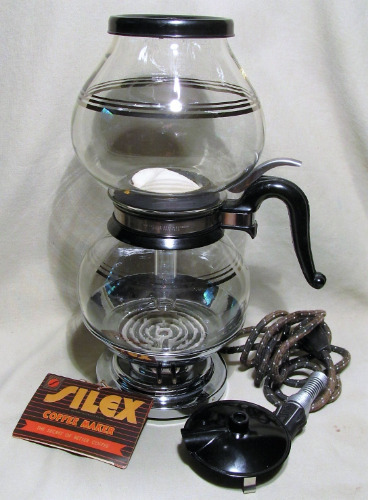 A really wonderful iconic vacuum syphon pot. This one is from the 40's when glass was not rationed and many companies went the glass route for the homemaker.